I will always be a student; and I’m an organized pupil too. I’m very good with note taking, calendars, to do lists, journals, and other sorts of information gathering techniques. When I started taking ballet class, I put my skills to work on my new subject as I would any other new course work. I keep a dance class journal and a dance class calendar. I can tell you when I took class, what kind of class, with what teacher, and what was covered in the class from the very first class I ever took. I have notes about exercise combinations, music, corrections, thoughts, and feelings. I know the exact date that I completed my first pirouette, first time I fell down in class, first time I held a balance to the very end of the exercise, and the day I went out from my foot injury and how many classes that I missed! Currently I keep a calendar and a journal. In the calendar, I keep master calendars of all the classes that are available, with teacher info, studio addresses, and phone numbers. I schedule classes and keep track of class cards. I log in performances that I will attend and if I’m traveling to see a performance, I keep information regarding places to take class and ballet shopping in the calendar as well. Right after class, I take notes about the music, exercises, combinations, corrections, or other information that I want to hang on to before it all runs away from my brain. I also keep some sizing information for my ballet gear, particularly about shoes. Flatties can be sized so differently that I actually forget what I wear and which shoe I prefer so I have those kinds of notes written down too. I also keep a separate journal. 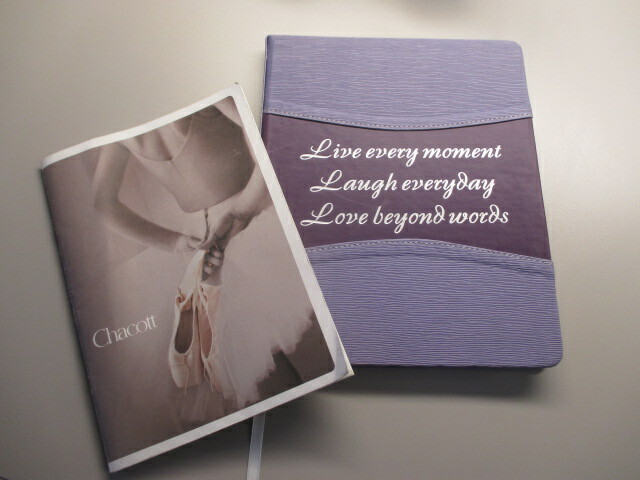 I use a notebook that I was given at Chacott on one of my ballet trips to Tokyo. Some time after class I try to find some time to sit down with a cup of coffee and my journal and write my more extended thoughts about classes and dance experiences. A lot of blog posts are born in this journal but it’s primarily a private place where I can talk to my ballerina self in complete honesty, even when I’m not feeling particularly positive about my experiences. In public, I try not to spread negativity, even when it’s an honest feeling because I have a thought that it is ethically unsound. The way I see it, we should be seeding the ground not salting it. I realize that not every one is a writer by nature and spending extended time writing isn’t going to be everyone’s idea of a good time but I will propose that any serious student should try to keep a dance calendar/journal, even if it is just to keep track of class schedules and perhaps take a few class notes. 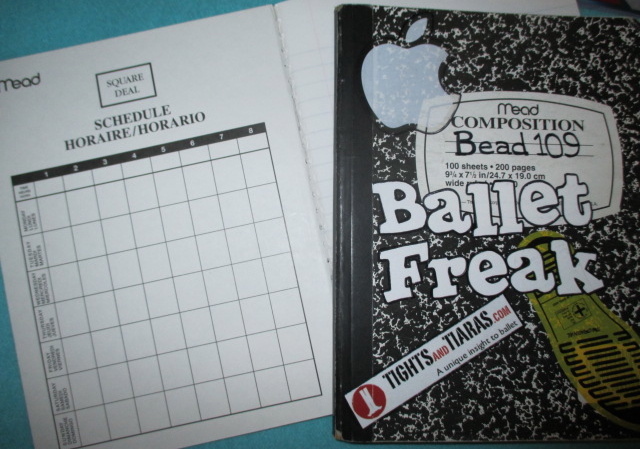 I’m interested… do you keep class notes or a dance journal of some sort? Why or why not? p.s. Another favorite for journal keeping are Mead Composition books, they even have a class schedule on the inside cover that can be used for regular class schedules. Love ’em! We were required to submit dance journals in college. Occasionally I would bust out some malarky to submit, but more often than not I just flouted that requirement. That would be an example of NOT being a good student (thankfully I still passed the classes)! In retrospect I can see the value in the exercise and it also served, in that case, as an open line of communication with the professors. But at the time I couldn’t imagine what I would possibly write about, I guess because I had been dancing since I was a kid and had a “just do it” attitude rather than thinking critically about my art. Now… well, I guess I just never thought about it! I suppose a blog is a journal of sorts, but since I want to leave a generally positive impression on my reader and also don’t want to potentially have any negativity that people I know IRL could discover, it’s not the most brutally honest venue. In that sense, well… you’re making me consider the benefits and maybe I will try dance journaling again! Rori – exactly!!! I don’t want to share or encourage negativity around dance and so in some respects I will not be painfully honest about some of my feelings in my blog. I feel a responsibility to share dance in a positive and accessible way because I love it so much. I want others to be encouraged to participate and to be enhanced by dance. There are so many challenges to learning dance as an adult, I don’t want to add discouragement just because I might have had an off day. My early blogging included an amount of grumbling and a certain level of doubt about this whole endeavor. I’ve never been happier to have grown and moved away from that, at least as a dance blogger! I’ve found that as an advancing beginner, writing down class notes has been invaluable to the learning and retention process. And as I’ve moved toward actually dancing – really dancing – I’ve found the critical thinking part of journaling has put me in touch with more of me as a dancer. So much more, in fact, that I can now refer to what I’m doing as dancing, which I have to say is a monumental step because for the first year, it felt like dress-up and pretending. If you do give it another go, I hope it enhances your dancing and brings you more dance goodness and joy! Great food for thought. I think I am your complete opposite. I write down nothing. Except maybe after a coaching…on random bits of paper which I promptly lose. My main record is my blog lol. But I like the idea of writing everything down. It probably would help immensely with remembering corrections, especially when I don’t see my instructor for almost a week. Truly it’s something to contemplate. Thanks for sharing. Thanks, Stef! A blog can definitely be a dance journal! A lot of dance blogs out there are just that. I don’t really use my blog that way but many blog post do originate in my journals. I used to keep a dance journal. Maybe I should try again. In my first year, I wrote down how many classes I took and any combination and correction I could remember. Now I only write down major corrections and combinations that are either very good or very hard. There’s no time! Your journal must be wonderful! I wish I had one like it. Thank you! I enjoy writing and it is a fun exercise for me. I understand completely not having a lot of time to do more than jot down a few notes. Sometimes just finding the time to fit classes in to a already full schedule can be a time juggle! I’ve given some thought to creating a ballet journal that people can use to make it easier to capture their thoughts. I wonder if anyone would find that useful?